PALM COAST, Fla. — Crossman & Company, one of the Southeast’s largest retail leasing, property management and investment sales firms, has negotiated the sale of Cobblestone Village, a 96,891-square foot shopping center at 270 Cypress Edge Dr. in Palm Coast, Fla.
Crossman & Company Managing Director Whitney Knoll, Director of Brokerage Services Christie Alexander and Associate Thomas Bolen represented the seller, CBL & Associates Properties, Inc. (NYSE:CBL) of Chattanooga, Tenn., in the transaction. Cobblestone Village is 97 percent leased. The Crossman & Company team has built a solid track record of connecting investment sales clients with qualified and sellers and buyers. Cobblestone Village is no exception. The buyer, RCG Ventures, is a privately funded real estate investment group that acquires and develops commercial real estate. The company’s primary focus is value-add anchored shopping centers with the potential for long-term ownership. “We are excited about our recent acquisition of Cobblestone Village which fits RCG’s strategy of acquiring well positioned assets in healthy secondary and tertiary markets throughout the country that allows us to add value through best in class leasing and management,” noted Scott Tarbet of RCG Ventures. Cobblestone Village is in the largest city in growing Flagler County. The center is less than a quarter mile from the I-95 interchange and positioned along Palm Coast’s main corridor, Palm Coast Parkway, with over 35,000 vehicles per day. The property features national tenants Belk, Carrabba’s, and Anytime Fitness and is contiguous to Lowe’s and Walmart. CBL is one of the largest and most active owners and developers of malls and shopping centers. CBL owns, holds interests in or manages 136 properties, including 84 regional malls/open-air centers. The properties are in 31 states and total 79.4 million square feet including 7.1 million square feet of non-owned shopping centers managed for third parties. Serving Florida, Georgia, Alabama, Tennessee, South Carolina, North Carolina, Mississippi and Virginia with offices in Atlanta, Ga., Boca Raton, Tampa, Miami and Orlando, Fla., Crossman & Company has experience selling shopping centers, triple-net assets, as well as mixed-use and lifestyle properties. For more information contact Thomas Bolen at (407) -581-6259 or tbolen@crossmanco.com or visit www.crossmanco.com. Crossman & Company is the premier real estate firm focused on serving retail landlords exclusively throughout the Southeast – with offices in Atlanta, Boca Raton, Tampa, Miami and Orlando – representing more than 340 shopping centers and 27.1 million square feet in Florida, Georgia, Alabama, Tennessee, South Carolina and North Carolina. The company was founded in 1990 with the goal of providing exemplary service to our clients around four core values: Maintain enthusiastically satisfied clients; Demonstrate servant leadership; Practice kindness, openness and humility; and Develop new talent. For more information, visit the company’s website at www.crossmanco.com. 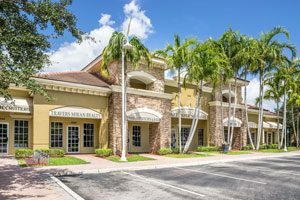 PARKLAND, Fla. – Crossman & Company, one of the Southeast’s largest retail leasing, property management and investment sales firms, has negotiated the sale of Parkland Town Center, a shopping center at 6600 Parkside Drive in Parkland, Fla. to CHG Real Estate Acquisitions LLC of Boca Raton, Fla.
Crossman & Company’s Managing Director, Brian Carolan and Senior Managing Director, Bruce Lyons represented the seller, a special servicer located in South Florida, in the $6 million transaction. Featuring 34,930 square feet of office, restaurant and retail space, Parkland Town Center is 95 percent leased and sits on 5.5 acres. “Parkland Town Center is in the heart of one of the most sought after neighborhoods in Parkland. This in-fill location creates significant barriers to entry for competing product,” noted Carolan. Serving Florida, Georgia, Alabama, Tennessee, South Carolina, North Carolina and Virginia with offices in Orlando, Tampa, Miami, Boca Raton, Fla. and Atlanta Ga., Crossman & Company has experience selling shopping centers, single-tenant, triple-net assets, as well as mixed-use and lifestyle properties. Crossman & Company is the premier real estate firm focused on serving retail landlords exclusively throughout the Southeast – with offices in Atlanta, Boca Raton, Tampa, Miami and Orlando – representing more than 340 shopping centers and 27 million square feet in Florida, Georgia, Alabama, Tennessee, South Carolina and North Carolina. The company was founded in 1990 with the goal of providing exemplary service to our clients around four core values: Maintain enthusiastically satisfied clients; Demonstrate servant leadership; Practice kindness, openness and humility; and Develop new talent. For more information, visit the company’s website at www.crossmanco.com.